The G20 annual summit of leaders (representing the world’s wealthiest nations) plays important roles in setting global agendas and in addressing critical issues. From its start in 2008, it has expanded in focus (from an initial agenda dominated by economics), while retaining an informal character (for example, there is no permanent secretariat). The event and process have therefore become a focal point for different groups interested both in the overall agenda and in specific topics. Groups respond to the specific priorities defined each year by the host country, often with elaborate preparations and advocacy campaigns. Groups that engage include global think tanks (T20), civil society (C20), and business (B20), alongside various ministerial processes and specific purpose working groups. In short, a meeting of leaders has become an important global institution, one that carries hope for both creativity and meaningful use of power. Since 2014, in Australia, an interfaith forum has convened each year in the G20 host country with the goal of ensuring that religious voices are heard in the G20 process. The effort has evolved from a scholarly event centered on religious freedom to a more ambitious and broad-based effort to bring together a “network of networks,” representing interfaith organizations, scholars, practitioners involved in different facets of global issues, and religious leaders. The forum takes as its points of departure the 2030 Sustainable Development Goals and the specific annual G20 agenda. The agenda for the annual forum thus mirrors the G20 leader agenda, but it also focuses on specific topics that religious communities see as vital for world peace and prosperity. It aims both to voice ethical dimensions of global issues that are too often buried in technocratic formulations and to make sure that the deep experience of religious actors is brought forward as an integral part of the global agenda-setting process. 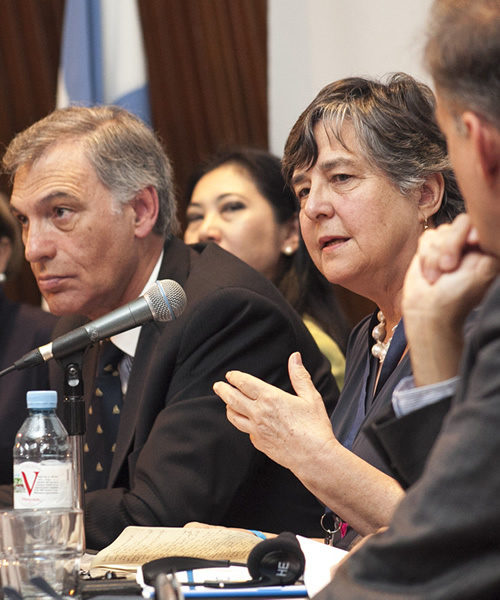 The 2018 G20 Interfaith Forum took place in Buenos Aires from September 26 to 28, two months before the G20 leaders meet. The three-day agenda was jointly planned over a six month period by Argentine leaders and a continuing G20 Interfaith Group. With vital support from the International Shinto Foundation, the forum agenda this year was far sharper than in prior years and reflected constant attention to translating good ideas into action, in part by ensuring that they are heard and that they represent areas of consensus among religious actors. The event also highlighted issues where there is disagreement, exemplifying a respect for diverging views and commitment to listening to others and to authentic dialogue. The 300 participants represented widely diverse institutions, networks, nationalities, and religious traditions, always with participation by Argentinians and those from across the world. The 2018 Interfaith Forum agenda focused on the challenges of inequality (echoing the Argentine agenda) and on topics that included the future of work and education in a fast-changing world. The forum included respected religious leaders who stressed the need to heed an ethical compass in world affairs, and to look to the “moral perimeters,” calling for rigorous and demanding attention to excluded groups that include refugees and displaced populations and those who suffer violence, with a focus on women and children. The urgent challenges posed to the environment represented a recurrent theme. The forum’s central recommendations and ideas for future work (for example, on health and children) will be transmitted to the G20 host. Plans are already underway for the G20 2019 Interfaith Forum in Japan and the following year in Saudi Arabia.